Sample Categories: Mediæval French and Palæography. French Secretary Hand, brown ink on paper, 38 lines, initials at top left margin & autograph signature bottom right; single sheet folded in two, inscribed on front only, each side measuring 6.25″ x 9.5″; significant fading, some foxing, fraying & tearing. entire made [i.e. was at leisure for two full days]. * With over 1.5 million parishes in France before the reorganisation instituted by Henri IV, it has been impossible to clarify Pierre Boudet’s extremely unclear hand with a standard geographical look-up. 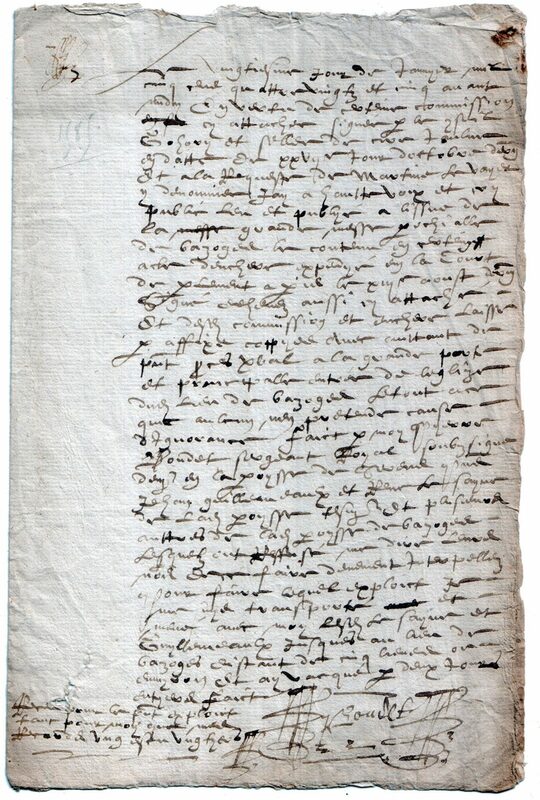 This represents a typical problem encountered in the transcription of early documents, particularly when the MS is frayed, ink-faded, water-damaged, or – as in this case – when it has been executed in haste as a rough draft, which will later be neatly re-copied with further details filled in. With multiple possibilities existing for the interpretation of numerous letters, Names and Places can be particularly challenging to decipher. It is therefore, unfortunately, not uncommon for question marks to remain in an otherwise completed transcript.